However, when talking about engagement and holy matrimony, a riddle is not only appropriate, but a framework for helping people to understand the meaning of marriage in an Orthodox life. Fr. Antonios Kaldas, a Coptic priest based in Sydney, Australia, and Ireni Attia, a Christian counselor, worked together to create Two Become One: An Orthodox Christian Guide to Engagement & Marriage. Inspired by a variety of sources, including pre-existing Coptic curriculum for young adults on relationships and marriage, this book shares many qualities with textbooks in that it is clearly organized, filled with discussion questions, and designed for reflection and contemplation. Starting from the “marriageability” phase to the married life of a couple, Two Become One guides its readers in a way that provokes a lot of thought about how they can grow, and be genuinely transformed, through engagement and marriage. Focusing on how to find a properly compatible spouse, the text not only talks about compatibility as an important part of a relationship, but dives further into the different layers and types of compatibility necessary for a couple. Part of it is to help the reader in their quest to find the right person, but also, in their words, to avoid experiencing deep disappointment: “…if marriage is about practicing Christlike love, then it involves loving someone in precisely those moments when he is least lovable, sticking by someone when you get nothing out of it, and finding and embracing the beauty in someone when she is at her ugliest.” Difficulty and disappointment are interpreted as organic, realistic parts of a marriage, and that is a major strength of Two Become One. Reflection questions abound in this book, and are designed for couples to discuss together in order to learn more about (and from) one another. Questions such as “What does agape love mean?” or “In what ways is your home like the Church?” serve as thought-provoking prompts on the meaning of marriage, and can serve as a constant source of conversation for couples new and experienced. This book’s focus on having authentic relationships that do not shy away from struggle is clearly stated, and the book clearly lays out what couples can expect in a marriage in terms of emotional and physical struggle. What makes the book unique is that important parts of both Eastern and Oriental Orthodox wedding rites are incorporated into the discussion, highlighting the differences between Greek and Coptic traditions. It also features scripts for couples to read through in order to understand how to work through complicated situations within a marriage. 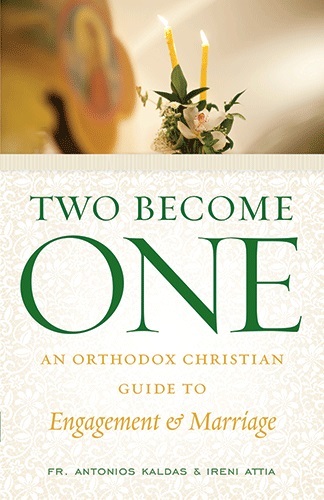 Overall, Two Become One is an accessible, thought-provoking, and powerful resource for anyone who wants to dive further into a stronger understanding of love and marriage in the Orthodox tradition. Whether someone is looking for a spouse, or found their 50 years ago, there is something to offer for all its potential readers. Dr. Nic Hartmann is a folklorist, museum education director, and blogger who maintains the page Thoughts of a Metanoia Bum. Seeing Orthodoxy for the first time during study abroad in Estonia, his folklore studies led him to join the Orthodox Church while in graduate school. A native of Indiana, Nic lives in Cedar Rapids, Iowa, with his wife Jen, and their two daughters.